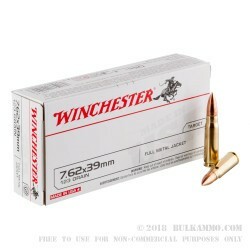 Beautiful, brass cased 7.62x39 for your sporting uses of the round including hunting and match target work. It’s not just for AK-47’s anymore. This round has seen a huge level of interest from bolt guns to upper receivers on AR-15’s to specialty chamberings and this is a great choice for more precision ammunition or for when you want to custom tailor some loads and need some reliable brass to work with. 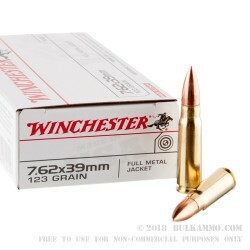 This 123 grain full metal jacket Winchester ammunition is a perfect companion for any task that doesn’t automatically default to steel case, Berdan primed ammo. A great load to have a few boxes on your shelf for when hunting season comes around and you really want to push the accuracy out of your AK clone rifle or your new AR upper conversion kit. By mil-surplus standard and byt the standard set by 7.62x39 ammunition over the past 30 years, this is by no means a cheap or value priced load. 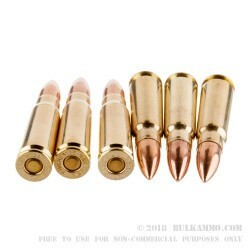 But it does fill a niche and that is brass cased ammunition with reloadable brass and a tier higher in inherent consistency of components and in accuracy when compared to military ammo. It also is much gentler on those custom bolt guns (though they might not be as popular as the semi autos in this caliber) for those who prefer brass cartridges and sub MOA performance. A: Hello, This brass cased ammunition is loaded with a lead core, copper jacketed projectile which contains no steel. This ammunition will have no issues passing a magnet test.